Home Motivation When Did You First Call Yourself a Runner! When Did You First Call Yourself a Runner! Ask a Runner her moment of Revelation – and she does get emotional! He too gets emotional! 🙂 So many miles logged in, beautiful mornings spent on trails and roads, late nights missed, event registrations done, injuries suffered, half -marathons run, full marathons to be done or done, dreams of many more and YET! What was that moment – When I called myself a Runner? I got some Runners to share their thoughts on their Precise – Runner- Moment! Enjoy! I ran my first ADHM in 2012, with a timing of 2:45 and was over the moon that I finished it! I was shy to talk about running to my friends, in the fear that it would get jinxed or people just wouldn’t get it. When I met people, I would always say, yes I run “sometimes”. Even if that sometimes was 7 days a week. I still hadn’t called myself a runner yet; until February 2017, I injured myself and had to go meet a doctor. I wanted to be mended quick, since I had a race coming up by the end of the month and had to get my point across to the doctor. Thus I proudly told him “I am a marathoner, I run regularly, please fix me.” I was surprised to admit all of this, without rehearsing it at all, but I guess somewhere I also knew only the right use of words would get me that serious attention. So there I was a runner, who admitted that only after an injury. I had a friend who ‘complemented’ me during this time by saying not all runners get injured, only regular disciplined runners who cross that crazy level barrier get injured, so ‘congratulations’ (!!!!) Yes, the admission did help a speed up recovery with the right physio stretches. As a kid and even after growing up I always hated running, because I never attempted it and thought it was very boring and tiring. I first ran in May 2014 in TCS. That was the first time I realized how beautiful running is. And that is also the first time I called myself a runner in my first event (TCS). For someone who had never run outside and who had not run more than 4 kms on a treadmill, covering 10kms without a single break in 67 minutess was a big thing. It was just amazing when I saw young, old, everyone run and overtake me. The energy was wonderful and that’s when I fell in love with it and a new ME was born. I started with 10kms, then did an HM, and did a lot of 10kms again in 2015. I tried one FM and directly switched to Ultra in one year. Once I started Ultra, I have hardly done timed events because Ultra gives me a high that nothing else does. I am in trance when I do my intercity runs , specially on ghaats and lonely highways and I do a lot of thinking and self analysis. I am in different world altogether. It gives a lot of satisfaction as I do these runs to promote health among women and to empower them, and at the same time I live my passion. I started running in March 2003, just to knock off excess weight I was carrying around. The distanes those days were just 6 to 8k per day and I was happy doing it since within 2 years I had lost around 25 kgs. One fine day a friend of mine challenged me to run 15k and I colly ran about the distance. That’s when it hit me that I am a Runner and it’s time I start participating in races. O have never looked back since then. Though I run all distanes from 10k upto 135 miles (217k), myfavorite is Full Marathon and upwards! Looking back, I think… it was always there; it is not that one day, something happened and I said “Hey, you know… I’m a runner!” No, I have the feeling that something was there, some attraction for going the distance… long, very long… I have done it cycling, and driving, but took some time to do it running. I did my first Half Marathon in 2004, out of a bet. 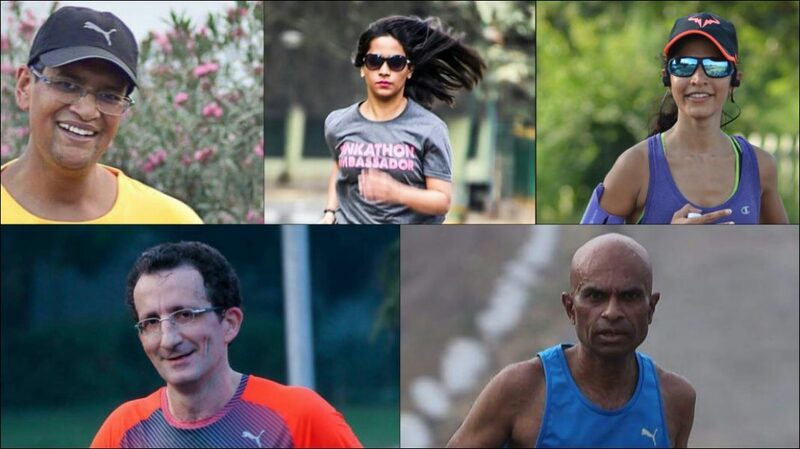 But if I have to choose a day, I would say middle of 2011, don’t remember the date, when after completing several ADHM’s I told myself: “what about… becoming Marathoner before turning 40?” (it was less than 1 year left). I made my first training plan and followed it till my ITB said “no more…”, couldn’t make it but there was no looking back and running became my first hobby. I completed 100 days of non stop running. It took so grit, tirelessly pushing myself to pack in a run no matter where I was. Because of my work, I travel endlessly, taking innumerable flights that too in the wee hours. The fact I kept my commitment and did considerable distances during that period – had me say it naturally – I am a Runner. The second time becoming a pacer during a SCMM and managing the run with perfection in spite of Mumbai heat and inclines, more so as it helped many runners achieve their dreams. It was amazing to see a bunch of runners feel the happy rush for having achieved what they had set out for and placed there trust in me. I started running by the end of 2014. I felt like a Runner when for the first time I took my running shoes with me on my vacation! It was a trip to Srinagar! The moment I laced up my shoes to run around the Dal lake on 26th January 2015, I felt like a Runner! Because now it had become fun and something I looked forward enough to take my shoes along on a vacation! Yay! Yes – I am a Runner! Anyone who loves running would relate to all of the above…Yes I have had lot of issues with my friends in saying no to late nights, drinks etc. then I have run Srinagar Half Marathon after sleeping at 2 in the morning as it was unavoidable 🙂 and not being able to run SCMM because of a knee injury despite of having a BIB in hand was a heartbreak. Running is one of the best things that happened to me!